Now may be the perfect time to upgrade your ride, and you might not even realize it. Did you know that it may be possible to not only trade in your vehicle for a newer, nicer model but also lower your monthly payment in the process? If you owe less on your vehicle than it's actually worth, trading it in can cover your down payment. Ultimately, that could equal you owing less on a new purchase than you might realize. Check out the benefits below to learn more. By using your trade as a down payment on a new vehicle, you have the opportunity to lower your monthly payments, while driving a new vehicle. Plus, depending on the current incentives that are available, you may be able to save even more. One of the most obvious perks of upgrading to a newer vehicle is a technology upgrade. If you've had your eye on key features like Bluetooth wireless technology, a backup camera or a navigation system, this may be the perfect opportunity to cash in. New vehicles include manufacturer warranties meant to protect you and your investment. By trading your current ride for a brand-new one, you're investing in your future by securing protection for one of your most valuable assets. We take pride in offering great value for trade ins. If you're interested in learning what your vehicle is worth, begin the process by using our convenient online trade assessment tool. Or, you can visit us in person to get a quote for your trade. It's all up to you. 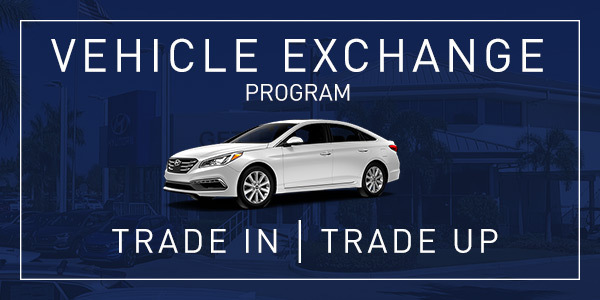 If you’re interested in learning more about the ways you can benefit from trading in your current vehicle, contact us directly, or stop by our dealership at 1950 Tamiami Trail, Punta Gorda, FL 33950. We look forward to seeing our customers from Punta Gorda, FL, near Port Charlotte, North Port, Venice and Fort Myers!